The global prefilled syringes market displays a fragmented vendor landscape with the presence of several mid-size and large players, says Transparency Market Research (TMR) in a new report. In this competitive market, savvy players are using improved materials to improve the quality of syringe, and to improve manufacturing processes that can help boost production volume, adds the report. In addition, the focus of these players is to monitor the production process, and make the necessary changes, so as to ensure the right amount of drugs are filled in syringes. Such initiatives are likely to help keen players make a mark in the global prefilled syringes market. Top companies operating in the global prefilled syringes market are Stevanato Group, Baxter International, Unilife Corporation, West Pharmaceuticals, and Becton Dickinson & Co. According to the TMR report, the global prefilled syringes market is predicted to expand at a CAGR of 9.3% between 2016 and 2014 vis-à-vis revenue. Rising at this pace, the market is expected to be worth US$7.9 bn by 2026 from US$3.5 bn in 2015. 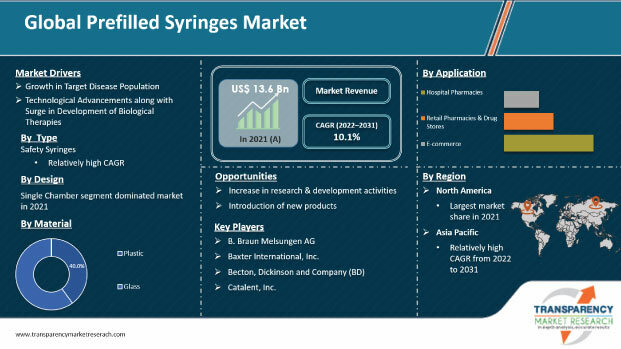 On the basis of application, vaccines is expected to lead the pack in the prefilled syringes market over the forecast period. In terms of geography, Europe is likely to maintain its key position in the prefilled syringes market. However, Asia Pacific is likely to exhibit a robust growth rate of 11.3% between 2016 and 2026. Globally, due to the rising burden of chronic diseases, healthcare systems are seeking alternate ways to complement for patient care. Patients that have a set prescription for injections do not need every day monitoring, and can take the prescribed injections on their own. Prefilled syringes have the necessary drugs filled in the exact amount that are easy to use. Patients can use prefilled syringes on their own or can take help from a family member for parenteral administering the drug. Prefilled syringes are convenient, sterile, accurate, and affordable, which makes them suitable to be used by patients. Such offerings of prefilled syringes are boosting the prefilled syringes market. In a medical emergency, prefilled syringes can help to save lives. In such situations, in the interim before medical care is administered, patients need not wait helplessly instead use prefilled syringes if advised by their doctor for such situations. Prefilled syringes with the exact amount of drug can work to prevent the condition from worsening. This stimulates the prefilled syringes market. Worldwide, stringent regulations monitor the manufacturing process and material used in the manufacture of injectable drug delivery devices such as prefilled syringes. Injectable drug delivery devices for both hospital use and home nursing need to be manufactured using permissible materials in strictly monitored environments. These materials need to satisfy free of contamination specifications, and need to be strong to prevent damage in the event of mishandling. Such requisites for the manufacture of injectable drug delivery devices in indirectly favoring the prefilled syringes market.